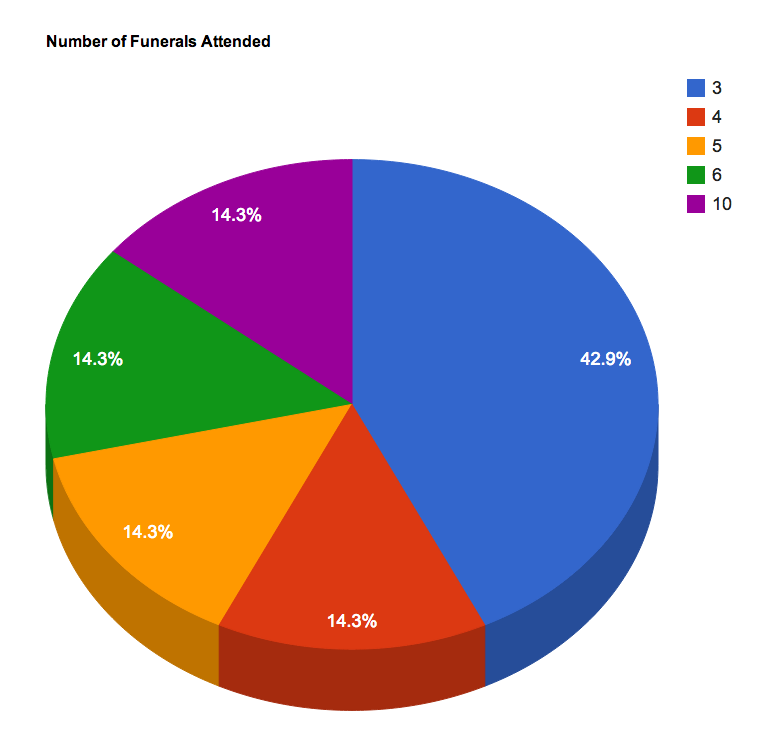 Here are the early results from the first survey on funeral attendance. The results were quite interesting, and while mostly what I expected there were a few surprises. As always, a big thank you to those who participated!! This would not be possible without the support and involvement from everyone. --> All participation is anonymous and appreciated! As has become standard most respondents were female, 80% in this instance. I am not sure why this is always the case, but it does not appear to have compromised the results. As for the age there was quite an even distribution. The only notably high group was 30%, which was the 21-25 bracket. Only 20% had worked or currently work in the funeral industry. So for the most part these results were from pure "mourners", those with limited to no inside experience or knowledge of the funeral industry but who have attended funerals. Fig. 1: Number of funerals attended. Funeral attendance was within the expectations, based on results from the previous survey. The previous survey found that 55% of respondents attended five or more funerals (which was unexpected at the time). These results were not notably different in this regard as 42.9% of respondents attended five or more funerals. However, because of the increased options there was more distribution and diversity of responses as illustrated in Figure 1. above. This survey gathered a more dynamic and thus more comprehensive understanding of funeral attendance. We now see that a good portion of respondents attended five or more funerals. Yet the numbers were actually quite spread out, and instead attending three funerals is the single largest attendance. While every respondent had attended a funeral only 40% had participated in organising or planning one. Those that had participated in the preparation of a funeral tended to describe their relationship to the deceased as close family (as in child or uncle/aunt) or close friends. Only 20% had pre-planned or pre-paid before the death. Yet 40% have discussed funeral plans with someone before their death. Not surprisingly 90% of the most recent funerals attended were in the same city as the mourner. Most people did not travel far to attend the funeral. It was found that 60% of funerals attended were religious, and that Catholic was the most common religion. Yet Catholic was not considerably higher than any other religion (such as Jewish). Surprisingly there was no correlation between religion and the funeral being cremation or burial. Respondents said 55% of all funerals they attended were "cremation and burial", 44% were "burial" only, and none were "cremation" only. The most recent funeral had been burial 77% of the time. This was unexpected as cremation is growing, so one could reasonably assume that burial should be lower than cremation. Or at leas there would be no noticeable difference. Instead cremation was notably lower than burial in every case. The rating of "comfort" and "upset" was quite interesting and informative, but within expectations. It is expected that women would give higher "upset" or lower "comfort" ratings than men. As women are seen as more emotional and thus are socially 'encouraged' to feel and display more emotion. Men on the other hand should have opposite levels as they are not as 'encouraged' to feel or display emotion. Thus men should either deny their feelings and/or not feel the same way. To measure and explore this the survey asked three separate questions. First how "upset" the respondent was on the last funeral attended. Then how "comfortable" they were on the funeral. Finally how "comfortable" they were with attended another funeral in the future. A fourth question asking to rate how "upset" other mourners were was also asked as a type of control. Fig. 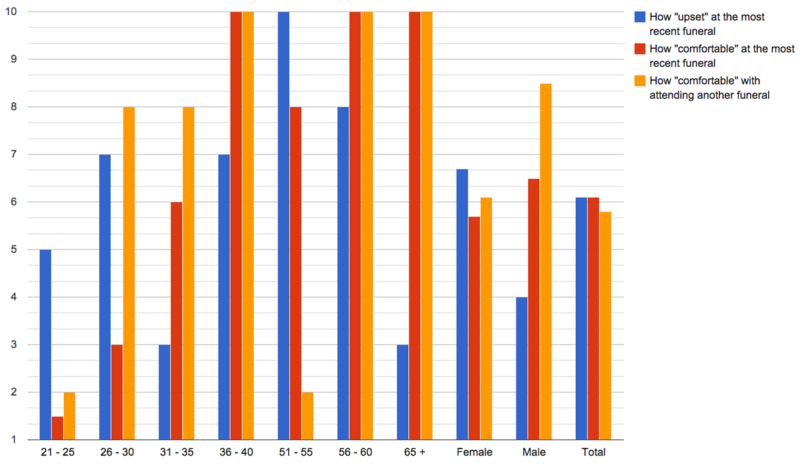 2: Averages of the three questions by age, gender and total. Women rated themselves an average of 6.7 for how "upset" they were on the most recent funeral. Men gave an average of 4 for how "upset" they were. The total average was 6 for both genders combined. Women gave an average rating of 5.7 for how "comfortable" they were on the most recent funeral. Men gave an average of 6.5 for how "comfortable" they were. The total average was 5.8 for both genders. Women gave an average of 6 for how "comfortable" they were with attending another funeral. Men gave an average of 8.5 for how "comfortable" they were with this. The total average was 6.6 for both genders. These results displayed in Figure 2. clearly show that women gave a higher "upset" and lower "comfort" rating on all questions compared with men. Which was only to be expected, and is not considerably different. There are several possible reasons for this, but whatever the case it is clear gender plays a big part in how we perceive and feel about the funeral. Comparing these questions with age demographic was interesting as well, but again not surprising. For the most part younger people were more "upset" and less "comfortable" than older people. This could be due simply to experience, as in younger people have been to less funerals and are not as use to them. Or it could be due to another factor or cause, more work would be needed before developing a theory. Based on the results from the previous survey I was curious to see how respondents would rate how "upset" other mourners had been. To see if women rated others as higher than men did, which turned out to be the case. Men gave an average of 6.5 for how upset other mourners were, while women gave an average of 7 for this. The total average rating was 6.8. While the difference between the genders is minor it is consistent with the other results from above. The results from the previous survey indicated that mourners did not have a high 'awareness' of certain aspects of the funeral. In the last survey only 33% could name the funeral home responsible for the most recent funeral they attended. This was something I wanted to explore, to work out what was remembered by mourners and thus important to them. To do this I asked a series of questions from the who was funeral home to what the coffin was like. Respondents from this survey also had trouble naming the funeral home responsible, only 44% could name it. Yet 80% could name the cemetery or crematorium. This was a bit odd as one would reasonably think that mourners would remember the funeral home and cemetery/crematorium relatively evenly. But this was not the case as respondents remembered the cemetery crematorium at almost double the rate of the funeral home. While surprising it is not unexpected at all. Mourners often talk about the cemetery/crematorium and even plant a rout to and from it. So they have to consciously look it up. Plus many visit cemeteries/crematoriums as these places become sights of memory and become personally important. The funeral home on the other hand has none of this, it is not looked up nor a site of personal memory. Thus it is not unexpected that mourners are much more likely to remember the cemetery/crematorium. When asked about the coffin 70% could name the colour of the flowers on it. But 90% could describe the coffin. A lote more conscious attention is placed on the coffin which is also something of personal importance to many. This only further supports my theory that the coffin is a thing of significance. How people can remember it so much better than the funeral home responsible for the whole thing. These results loosely 'indicate' that mourners are not unaware on the funeral. That for the most part they are not distanced, unobservant or so on. As mourners can remember little details about the coffin such as the colour of the flowers with relative accuracy and ease. Instead the low rate for the funeral home indicates that mourners focus on certain things quite heavily. Specific and certain information is given preference as it is considered important. And other information is overlooked or forgotten as it is not considered as important. TOn the last survey respondents gave an average rating of 8 for how "well" the funeral went. This time the average was 9, so no major change. Which is quite consistent with my other anecdotal research. Mourners tend to have a high rating of the funeral, even if there are little mistakes as they do not notice these mistakes. The previous survey found funeral staff were twice as likely to carry the coffin on religious funerals. Unfortunately the previous survey did not dig into what type of "carrying" this was. So it meant it was impossible to gather a detailed understanding of this. On this survey the types of carrying were broken into three groups, 'into the service', 'to the hearse' and finally 'to the grave/crematorium'. To really explore who carried when on the funeral. Only 20% of respondents had ever carried a coffin, so immediately the results pointed towards funeral staff being more likely to carry. - Carried into the service: funeral staff 50%, mourners 30% and unknown or coffin already in place made the remainder. - Carried to the hearse: mourners 80%, funeral staff 20%. - Carried to the graveside or crematorium: unknown 50%, funeral staff 16%, mourners 16% and coffin already in place making the remainder. - Carried into the service: funeral staff 33.3%, unknown 33.3% and coffin already in place 33.3%. - Carried to the hearse: funeral staff 50% and unknown 50%. - Carried to the graveside or crematorium: funeral staff 50% and unknown 50%. Funeral staff are more likely to carry into a service or at the graveside or crematorium on a religious funeral. Which is in keeping with results from the previous survey. Despite this mourners do actually carry a lot on religious funerals. Mourners are much more likely to carry to the hearse on a religious funeral. Having said this one needs to remember that the respondents are limited and most non-religious funerals were "unknown" or funeral staff. The mourners might have carried for in over half of the 'unknown' situations, or they might not have carried at all. So the results are interesting and do provide some insight but need to be taken with a bit of hesitation. They also indicate further research could be useful and informative. Bellow are the results for carrying the coffin for both religious and non-religious funerals combined. Fig. 3: Carrying into the service total. 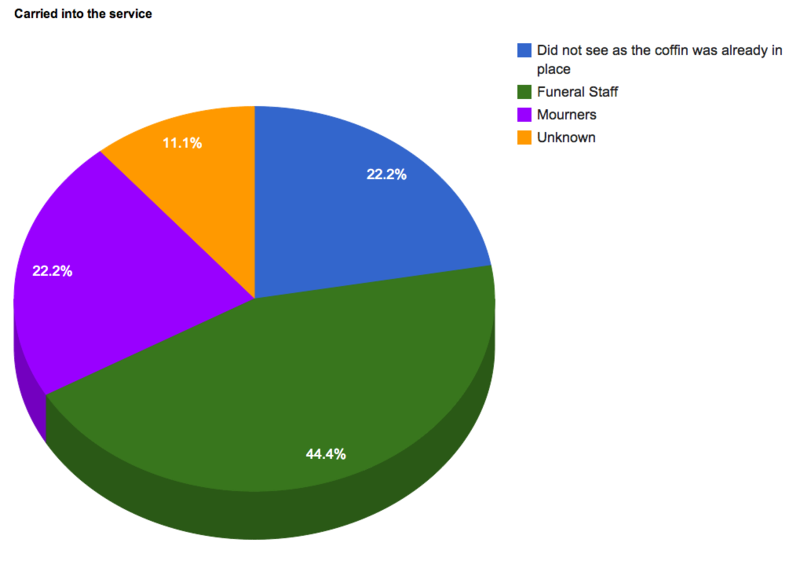 As figure 3. demonstrates funeral staff are more likely to carry into the service. Following this mourners or the coffin already being in place (presumably by funeral staff) is the next most common. This is in keeping with the results from above and shows how funeral staff play and important and active role in the funeral. Interestingly mourners are much more likely to carry into the hearse than any other group, carrying it 50% of the time. Funeral staff only carried 25% of the time. Indicating this is the most part where mourners are most likely to carry a coffin. This is a topic I wish to go over in detail another time, but essentially it is here where people feel most comfortable to carry. And here where they want to. These results are consistent with other research and anecdotes. It was unknown who carried on 55% of funerals at the graveside or crematorium. Funeral staff only carried 20% of the time. While unknown and the coffin already being in place made up the remainder equally. Based on fieldwork and other information I would assume funeral staff carried a majority of the time for this stage. Except that they did so before the mourner could see or the mourner did not notice. Who carries at this stage is not as important to the mourner as the carrying itself. Thus it is forgotten or overlooked to start with as it is simply unimportant. More research is certainly needed for a number of reasons. Firstly the respondents were limited in number, so the conclusions and results might not be reliable or applicable. Yet the results were interesting and informative, indicating both room and need for more research. Which is quite positive and exactly what was wanted from this survey.